As mentioned in my homemade secret santa post I mentioned that every year between Christmas and New Year we get together with the extended family to celebrate Christmas. 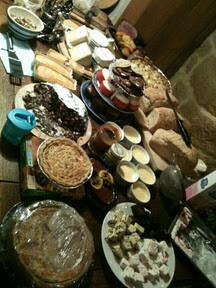 It's always noisy, chaotic and full of food and drink, just as Christmas should be! 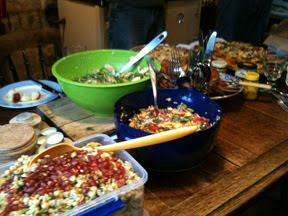 This year we were responsible for the vegetarian main and a dessert for the cooked lunch and a salad and baked treats for the buffet supper. 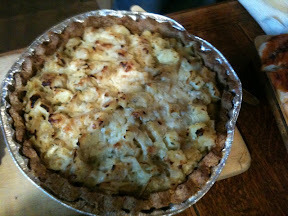 For the main I decided to make Homity Pie, this is is, a totally classic, Cranks recipe, from the Cranks Recipe Book. For anyone who doesn't know Cranks they have been championing wholesome vegetarian food for years, I believe they started in the 60s in Carnaby Street, but I could be wrong. Also as far as I know they were sold some years ago and now are far more commerical and therefore just not the same, but the good old recipes are still amazing. 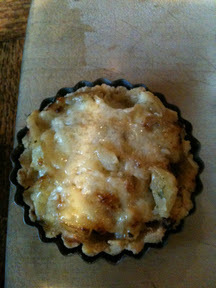 Homity Pie is basically a wholemeal pastry case with a potato, onion and cheese middle. It is very filling and warming so perfect for a winters day or a subsitute for a roast dinner for someone who doesn't eat meat. I was feeding the five thousand so made 3.5 times the amount in the recipe below. I also made a mini pie for my cousin's little one who is coeliac and therefore can't eat gluten. This was exactly the same but I subsituted the pastry for a gluten free version made with 1oz of Doves Farm Gluten Free flour and 1/2 oz of butter and a dash of water. This pastry is far more crumbly than normal pastry so you may well need to piece it together and fill in any cracks. 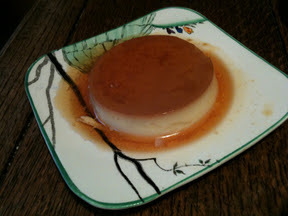 For the dessert my mum made creme caramel's. She is the queen of this simple, but difficult to perfect, recipe and her creme caramels always turn out perfectly. Plus when my cousin's little boy was about two and quite a fussy eater he wolfed one down in about 3 seconds flat and looked up for more, so we thought we had no choice but to make them again for him! 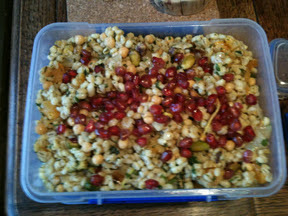 For the salad I made a barley middle eastern salad which is adapted from a recipe on www.simplyrecipes.com. The barley is studded with jewels of preserved lemons, pistacios, pomegranates and dried apricots. I absolutely love preserved lemons and the pomegrante seeds give this a lovely burst of flavour. Barley is such a low cost filling and healthy grain which is fab chucked into soups and stews to turn them into a meal in themselves. I also think it feels very comforting, which is great at this time of year. My sister made a variety of cakes and cookies for the supper. She made the cupcakes in this post plus some chocolate ones with chocolate icing which are basically made with just the chocolate sponge in this recipe plus the same icing but with the addition of some salted caramel sauce on the side for people to drizzle over. These were both piped with a Wilton 2D nozzle and the vanilla ones topped with a little glitter. She also made the same cupcakes with Dove's Farm Gluten Free Self Raising flour for my cousin child. 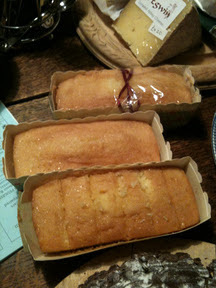 The lemon loaves are these, but in mini paper loaf cases which I found in a little gift shop. Finally she made some cookies, which were based on the same recipe as these but as well as chunks of white chocolate she added chunks of biscuit, fudge and mini marshmallows to turn them into rocky road cookies and then made some vanilla ones with chocolate chunks. 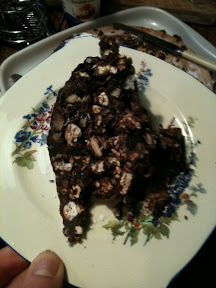 Which are the same recipe but with the cocoa subsitutued with extra flour. 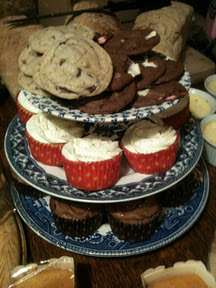 Here are the cupcakes and cookies displayed on the 'up-cycled' cake stand my cousin made for my secret santa. 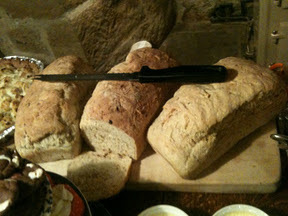 Rub the butter into the flour until it resembles bread crumbs. Add enough water to bring it together. Handle it with a gentle touch and don't work too much. Allow to rest for 30 mins. While the pastry is resting. Chop the potatoes into small cubes and boil until tender. Chop the onion into similar sized pieces and saute with the garlic in the oil until very soft. Add the potatoes, half of the cheese, parsley and salt and pepper and stir gently to avoid the potatoes breaking up too much. Roll out the pastry and line the cases. The recipe doesn't say to blind bake the pastry but I normally do. Fill the case with the filling and spinkle with the remaining cheese and bake in a pre-heated oven for 220C (425F/Gas Mark 7) for 20-30 mins until golden. Saute the barley in a little oil for 3-4 minutes, add the stock, water and a tsp of salt. Simmer until the barley is tender, anywhere from 30 mins to one hour, depending on the age of the barley. Strain the barley and rinse with cold water to cool it quickly. Drain as much water out as you can and the lay out the barley on a tray. Drizzle with oil and mix to coat. In a large mixing bowl add the remaining ingredients. Add the barley and mix well. Grease 8 ramekin dishes. Put 4oz granulated sugar and 4oz of water in a small saucepan. Heat without stirring until it forms a syrup which is deep brown and whirls of smoke have started to rise. Quickly and carefully pour the syrup into the ramekin dishes, swirling each around to coat the bottom. Put 1 pint of gold top milk into a pan with a knob of butter and a tablespoon of sugar, When heated to lukewarm pour it over 3 beaten eggs and whisk. 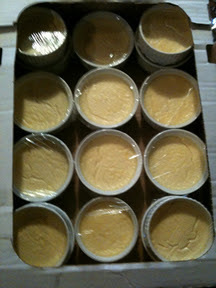 Place the ramekin dishes in a roasting tin, strain the custard into each and then fill the roasting tin with water until it is about 3/4 of the way up the sides of the dishes. Place into an oven preheated to 130C and bake until set, approximately 1 hour and 15 mins. Cool and refridgerate over night. By the next day the caramel will have returned to a runny liquid. To server run a knife around each ramekin dish and turn out onto a plate allowing the caramel to pool around the custard. 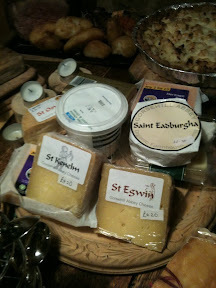 Put some pouring cream on the table for people so people can add some if they wish.